Recently I started working on crawling through some science databases of several large telescopes to see what data can be found in these archives. Some of the most interesting archives I found are, amongst others, the Subaru Telescope, the Gemini Telescopes, the Canadian-French-Hawaii-Telescope (CFHT) and of course the Hubble Legacy Archive. This image shows a mosaic of Messier 77 made from data of two of these databases. The widefield data was observed by the CFHT in visible light using Sloan u,g,r-filters, which is comparable to standard rgb. This image has a resolution of 0.28”/pixel, and is as far as I have found one of the most detailed images of this galaxies available. The central part of this galaxy was observed by the Hubble Space Telescope and I used the data I generated for my price winning image of M77, which received a second place in the Hubble Hidden Treasures competition in 2012. The data from the CFHT is really a great place to start. This 3,5 m / f 3.9 telescope has a huge ccd, comprised of 36 separate sensors, covering a field of 1×1 degree with a resolution of 0.18”/pixel. The total image is size is a mesmerising 340 Megapixels. I downloaded the subimages of 2 ccd sensors covering M77 for this image in the mentioned filters and created an rgb image from this. The process of this I will describe in further detail during my workshop at the CEDIC conference in March in Austria and will be public after that. In 1848, Lord Rosse described the galaxy as having a spiral structure together with 14 other nebulae of spiral nature, which we now know to be galaxies. Now it is known that M77 is a spiral galaxy at a distance of about 50 million light-years with a diameter of about 170.000 lightyears. At first sight, M77 looks like every an ordinary galaxy. However when examined closely some oddities appear. The core is much brighter than its direct surroundings. Spectral analysis reveals huge amounts of glowing gas present in the core, triggered by the presence of a black hole in the centre of the galaxy. The black hole is highly active and gaining mass by swallowing materials from the galaxy core. The cores of these types of galaxies are called AGN (Active Galactive Nuclei). The galaxy belongs to the class of Seyfert galaxies that show clearly different spectral emission than ordinary galaxies, caused by the presence of huge amounts of gas not belonging to stars in the core. Observations over a five day timespan with the Chandra X-ray observatory showed matter is being accelerated away from the core by the violent processes going on there. Over distances of up to 3000 light-years, material is ejected with speeds up to 2.5 million km/h, actively suppressing star formation near the core. 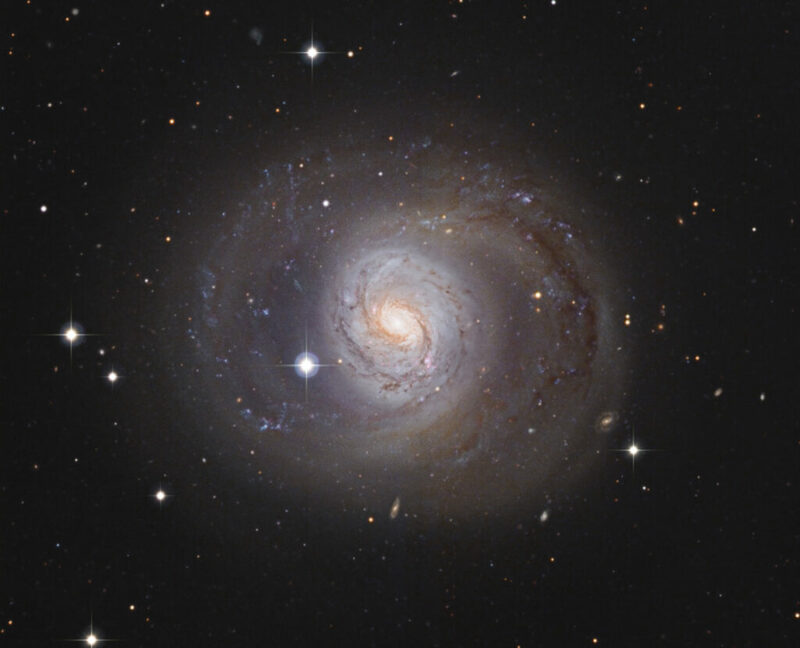 M77 is the largest member of a small group of galaxies which includes spiral galaxies NGC 1055 and NGC 1073 as well as five small, irregular galaxies located in the constellation of Cetus. This data was generated using the facilities of the Canadian Astronomy Data Centre operated by the National Research Council of Canada with the support of the Canadian Space Agency.